I ask that you become an urban explorer, a cultural detective, an orienteer and a legend tripper. Expand your definition of ghost. This city is haunted by the ordinary forgotten lives unmarked by tragedy. Haunting is memory, but haunting is also the knowledge that other things, most things, are unremembered. Most people are unremembered. Most moments of lives are unremembered. because there’s something that simply cannot be about a place that was and isn’t. In this splendid hotel, one of Jacksonville’s finest, one may find every known convenience in first class hotel operation, including radio in every room, the South’s finest roof garden, modern coffee shop. A most unique tavern and bar, and 100% air conditioned with optimal fingertip control by guests. Garage directly connected with lobby. Reasonable rates posted in every room. Robert Kloeppel, President and Director. You are welcome at The Mayflower and comfortable. The Hotel is thoroughly modern, well managed, conveniently located, where everything is done to fill your stay with happy impressions of fine Southern hospitality. Delightful large outside rooms, single or ensuite with baths, are available; quiet, comfortable rooms, beautifully furnished and restful. Rates Single—$2.00, $2.50, $3.00, and $4.00. Double—$3.00, $4.00, $5.00, $6.00 and $7.00. In 1998, a back room at Burkhalter Wrecking, Inc. on Kings Road (“For over 70 years have been tearing down old buildings across Jacksonville”) offered for sale several original leaded glass panels from ceilings of the Mayflower. Clear panels went for $35. Green panels went for $50. Mildred Louise Elrod, who passed away on Thursday, July 30, 2009 at the age of 95, spent many nights dancing to big band music in downtown Jacksonville in the early 1930s. On one such night, dancing at the Mayflower Hotel, she met Alonzo M. “Lonnie” Elrod, who would become her first husband in 1935. President Franklin Delano Roosevelt’s 52nd birthday, January 30, 1954. Civic clubs and socialites gather for a “cabaret dance” at the Mayflower. The place is packed. An 18-piece orchestra. Saturday night dancing at the Mayflower Hotel. The AT&T Tower stands 447 feet tall, 32 stories, the third tallest building in the city, takes up an entire city block, construction finished in 1983. 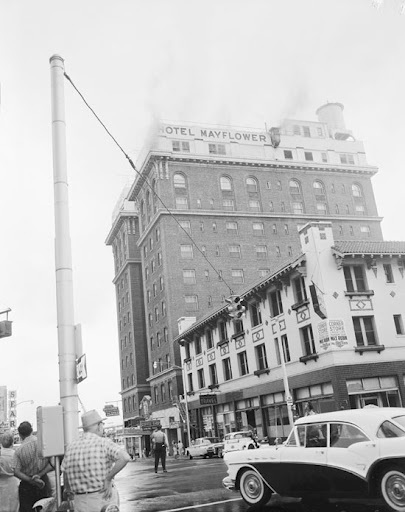 In 1978, it takes 11 seconds to implode the Mayflower. 11 seconds. Finest roof garden in the South. The downtown hotels, all shutting down and disappearing. 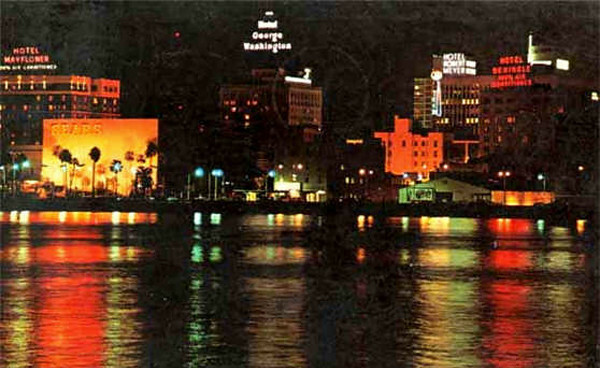 The Seminole, the George Washington, the Roosevelt, the Jefferson. Now the Mayflower. The ghostliest thing is invisibility. 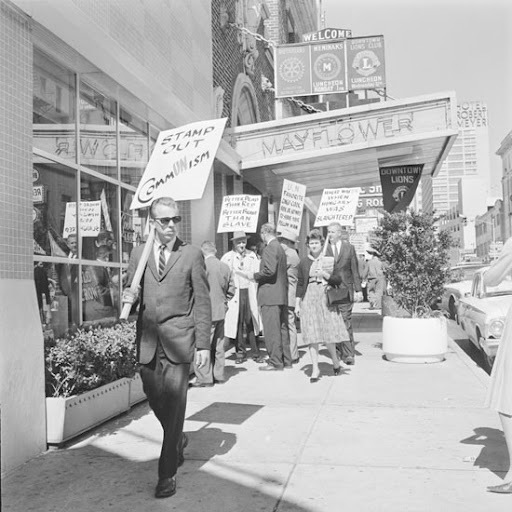 Even if you do write something, even if you write, “Saturday night dancing at the Mayflower Hotel,” how do you measure those seven words against everything they seek to and fail to represent? Green panels went for $50, dusty brick back room of a salvage yard, Kings Road.